The Porkie with a view. All photos by Shari Bayer. Not having a travel buddy doesn't stop Shari Bayer from hitting the road. Our favorite solo traveler went to Spain to eat at the world's best restaurants, flew from NYC to Napa to have dinner at French Laundry, and showed a bungee cord Down Under who's boss. On this trip, she went to Hawaii (that supposedly totally romantic island) and had more than enough fun for two. HAWAII – Forget the notion that Hawaii is only for romance. I let go of the idea that it's a place exclusively for lovers looking to get away, and decided to take a long-desired trip to the islands on my own. It was amazing. My vacation revolved around the , which, since I'm a restaurant publicist, technically made this a work trip. I booked eight nights: four in Maui, the rest in Honolulu, Oahu. It was a ten- hour flight from NYC, and the moment I landed in Maui, I started brainstorming ways to open a second office on the island. Convenient, no. Absolutely beautiful, yes. I rented a car and drove to the luxurious , where I got lei'd upon arrival. (I mean, when in Hawaii...) My fresh seafood dinner at was served along with my first glorious sunset, which was only rivaled by the Hawaiian sun over the next few days. 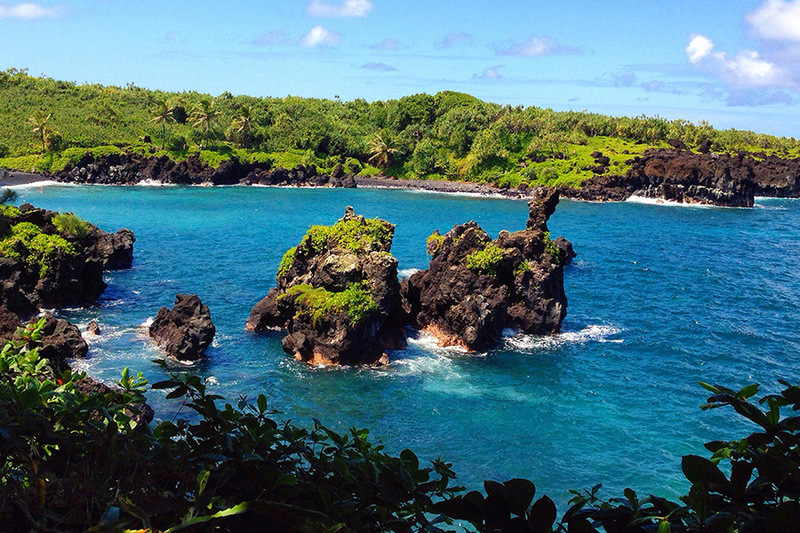 The green, black, and blues of Waianapanapa State Park. I drove (carefully) down the winding , stopping at (for homemade banana bread) and at Black Sand Beach at Waianapanapa State Park (for a gorgeous photo op) before turning around. Later, I made way to for the traditional luau feast . There was a lively hula show in front of the ocean as the sun set, and I ended the night with a walk on the beach under the bright moonlight. My days were easy to fill. 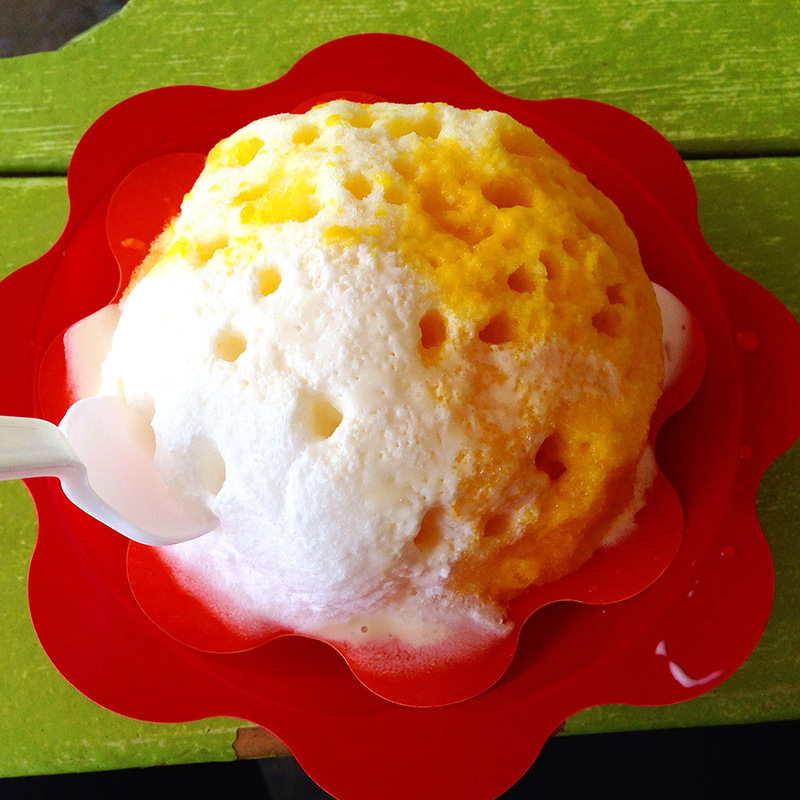 I found fantastic cheap eats, like Hawaiian shave ice. And I explored my adventurous side. 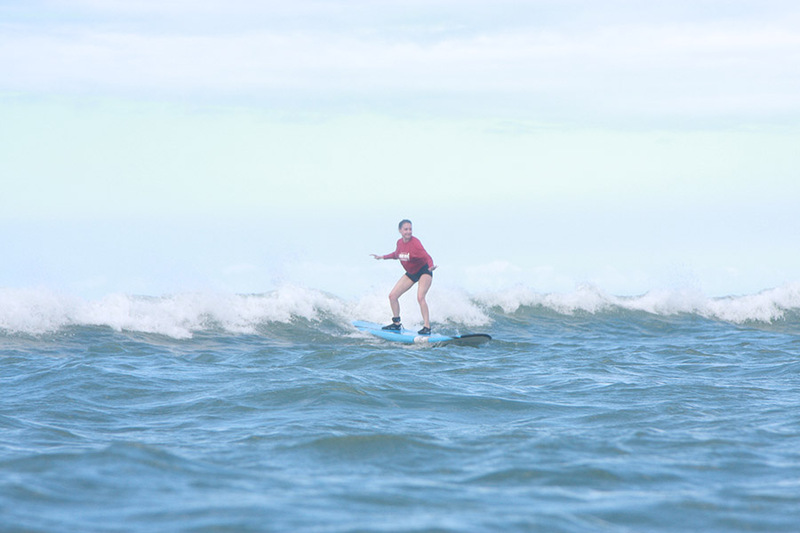 I took my first surf lesson with and got up my first time out. (Amazing!) I paddle boarded. I snorkeled with giant sea turtles. Maui was at once peaceful and exhilarating. A companion? I was too busy having fun to notice I didn't have one. 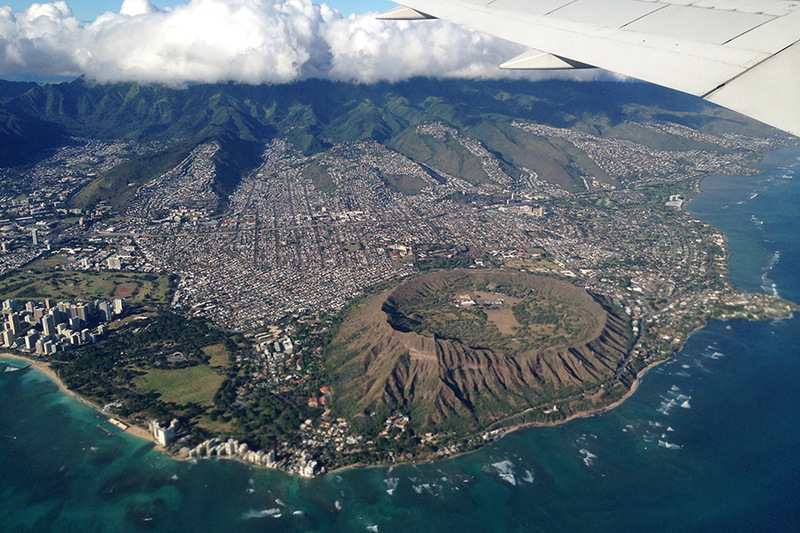 A bird's eye view of Diamond Head and Honolulu. I didn't want to leave Maui, but Honolulu was calling. I took a quick island hopping flight to Oahu and checked into , one of the host hotels of the Hawaii Food & Wine Festival. My penthouse room overlooked the pool and Ala Wai Boat Harbor at the end of Waikiki Beach. I strolled the picturesque sands filled with surfers, sunbathers, and loads of tourists. When I wasn't checking out Honolulu's restaurant scene, I was at festival events like A Lucky Modern Buddha Belly at The Modern. The impressive line-up of chefs and mixologists included Andy Ricker, Nancy Silverton, and Tony Abou-Ganim, and event chairs Roy Yamaguchi and Alan Wong. It's always nice to bump into industry friends in a gorgeous setting. The city vibe and nearby beaches of downtown Hololulu reminded me of my hometown, Miami. I rented to drive the scenic coast to peaceful Lanaikai Beach, which translates as "heavenly sea." It certainly lived up to its name. Another day I climbed Diamond Head State Monument in the heat for an exquisite view of the island, then raced down to hydrate. Mesmerizing beauty, divine sunsets, beach fun, and amazing food. Hawaii, you've done right by me. 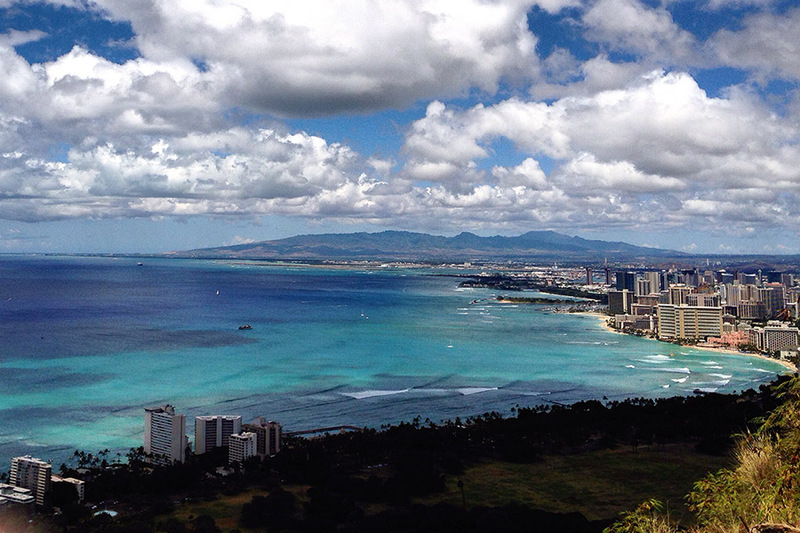 The visual reward from the top of Diamond Head. The setting alone made this restaurant special. I ate super fresh sushi on the patio during my first Hawaiian sunset. The perfect combo. The Road to Hana was so tedious and long. I totally welcomed the pitstop. And a warm loaf of their signature banana bread. Personal fuel for the drive. Tropical fruit delight at Ululani's. It's popular for good reason: Their Hawaiian shave ice is a must. I was lucky that the line wasn't too long when I arrived. I ordered mango, coconut, and banana with condensed milk and macadamia nut ice cream from the chalkboard menu. Wowie Maui indeed. I ate at the bar after my journey on the Road to Hana: a sashimi trio of fresh-as-can-be ono, ahi, and onaga. The water location made for great sunset views, and may explain why the place was packed with well-advised tourists. 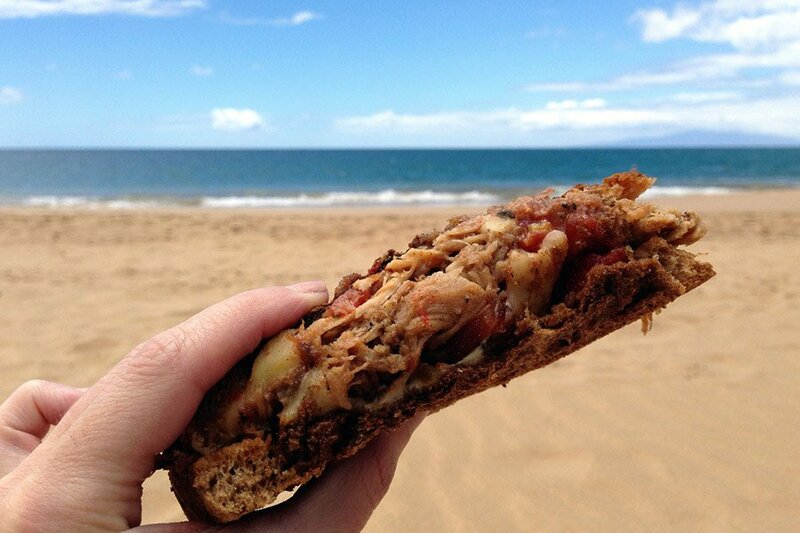 The Porkie sandwich from the casual beachside eatery hit the spot after my morning surf workout. I took my sandwich to go and walked across the street to Kamaole Beach, where I chowed down with sand in my toes. A popular restaurant owned by Roy Yamaguchi, one of Hawaii's most famous chefs. It's a tourist trap, but the food is good. I settled at the chef's counter and ate the Beach Walk Trio: hibachi salmon, macadamia nut-crusted opah, and misoyaki butterfish. The butterfish was sublime. Former NYC rock star chef Lee Anne Wong relocated to Honolulu a few years ago, and I was so excited to try her all-day breakfast restaurant. (Lee Anne actually advised me on all of my Hawaii hotels, so thanks, chef!) When I arrived in the early afternoon, I found her expediting on the line, so I sat at the bar to watch the action. I loved the fruit bruschetta, and one of her signature dishes, fish and eggs skillet. Simply fantastic. 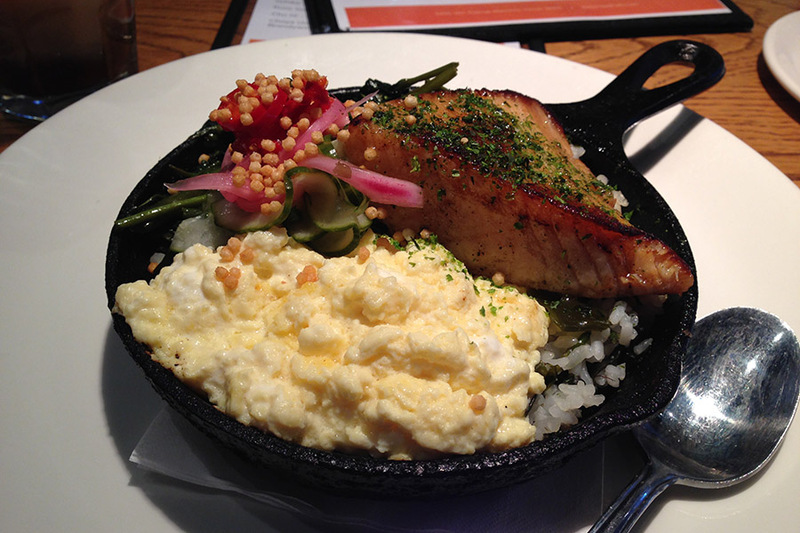 Fish and egg skillet at Koko Head Cafe. The oozing goodness of a malasada. Founded in 1952, the Honolulu institution is known for the Portuguese dessert, malasadas — glorious puffy donuts. 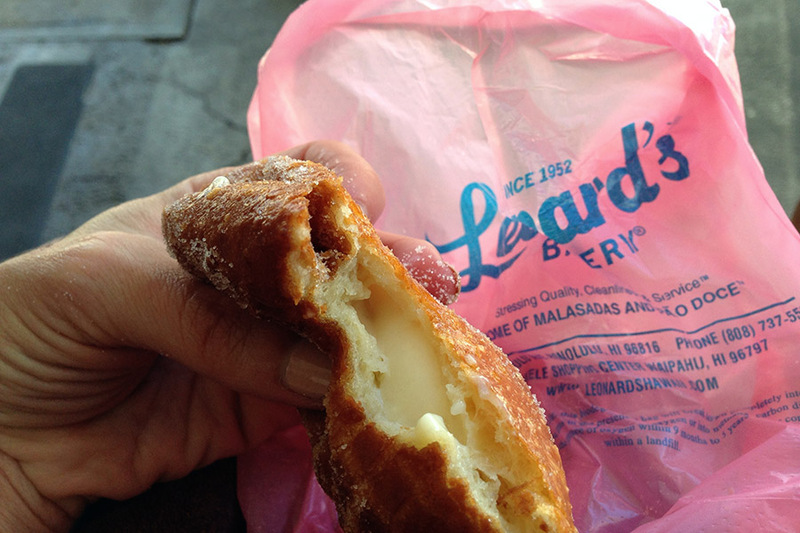 Sitting on a bench in the parking lot with other tourists, I devoured one malasada puff with macadamia nut custard. No ambience, but what a treat! I had my very first acai bowl here after hiking Diamond Head in the simmering heat. I could not have asked for a more refreshing, healthy, and delicious meal than frozen, blended acai berries topped with bananas, strawberries, blueberries, and granola. The original namesake restaurant of Hawaii's notable chef, whom I met at the Hawaii festival, was a tough reservation to get. But I scored spot at the chef's counter, only to find out later that I was the only diner at the counter that evening. I ordered the Tasting of the Classics menu, which was excellent. My favorite courses were butter poached Kona cold lobster and coconut dessert. Alan Wong's more casual place is located in Macy's at the Ala Moana Center. My lunch was Kalua pig BLT and caesar salad with thirst-quenching lemonade ice tea. The cool Asian-meets-Western spot in Chinatown, one of Bon Appetit's 50 Best New Restaurants in America in 2014, was on my to-do list. Dining at the bar, I had two signature dishes — Laotian fried chicken with pickled chili, fried shallots, and roasted peanuts, and P&F pho with smoked bacon, twelve-hour brisket, and soft egg. It was too much food for one, but I don't regret over-ordering. Shari is the president and founder of , which specializes in culinary, hospitality, lifestyle, and entertainment. She is also the producer and host of on Heritage Radio Network. You can follow her on Twitter at and . She travels for the desire to see the world, experience new things, and eat amazing food.